Don't have time to read? Scroll to the bolded headlines for all the important info. When the government tried to deny their children the opportunities they had sacrificed for, Gonzalo and Felicitas Mendez weren't willing to give up without a fight. It was World War II and the Mendez family had just moved to Westminister, CA, to rent and work a farm of their own. Like many parents today, Gonzalo Mendez and his wife Felicitas worked long hours as farm laborers to give their three children the opportunities that they never had. "WHITES ONLY - NO MEXICANS"
But when Gonzalo and Felicitas tried to enroll their children Sylvia, Gonzalo Jr. and Jerome in the local school, they were told that the school was for "whites only", "no Mexicans allowed." Their children would have to go to the "Mexican school", two shacks on a dirt lot. They went to court, not just for their own children, but for all the Latino schoolchildren in Orange County. Gonzalo refused to accept this. He went to the principal, the superintendent, finally the school board. The all said no. But Gonzalo wouldn't go away quietly. He rallied four other Mexican-American families: Gomez, Palomino, Estrada, and Ramirez. Together, they went to court, not just for their own children, but for all the Latino schoolchildren in Orange County. The school board argued that Mexicans were inferior to whites and couldn't speak English; Sylvia proved them wrong. "People of Mexican descent are intellectually, culturally, and morally inferior to European Americans." Eight-year-old Sylvia Mendez testified, in perfect English, demonstrating to the court that Latino Americans were just as smart and capable as white students. 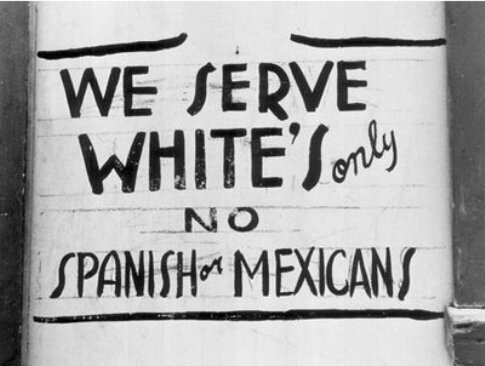 The judge ruled in favor of Mendez and the other Mexican-American families - SEPARATE IS NOT EQUAL. The judge argued that segregation was unconstitutional, it created inequality where there was none. The same argument would later be used in Brown v. Board of Education, the Supreme Court case that ended segregation across America. The school board appealed the decision, but this time the Mexican-American families had the support of the NAACP, League of United Latin American Citizens, Japanese American Citizen's League, and the World Jewish Congress. California became the first state to outlaw segregation. Thanks to the perseverance of Gonzalo, Felicitas, and the other Mexican-American families, and the bravery of young Sylvia, California became the first state to desegregate schools, seven years before Brown v Board of Education. Sylvia went on to become a nurse, adopting and raising two girls while working in her field for over 30 years and continuing to be an advocate for education and equal rights. She met with President George W. Bush and was awarded the Medal of Freedom by President Barack Obama. Two schools in California have been named after Gonzalo and Felicita Mendez, the "Gonzalo and Felicitas Mendez Fundamental Intermediate School" in Santa Ana, and the "Felicitas and Gonzalo Mendez Learning Center" in Boyle Heights. The families who went up against the school board prove that together, we can make a difference. To make change, we can't afford to back down.